Sakura Dote Park (Cherry Blossoms Causeway Park) is the special scenic site of cherry blossoms in Ichikawa city, the park is also named 'the Path of Literature'. 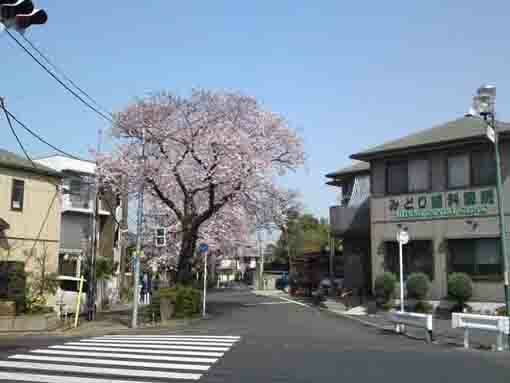 The park is about 400 meters in length under dozens of cherry trees, and some equipment in the form of kawaii animals and signboards inscribed the descriptions of some poets and writers in connection with Ichikawa city are stood. 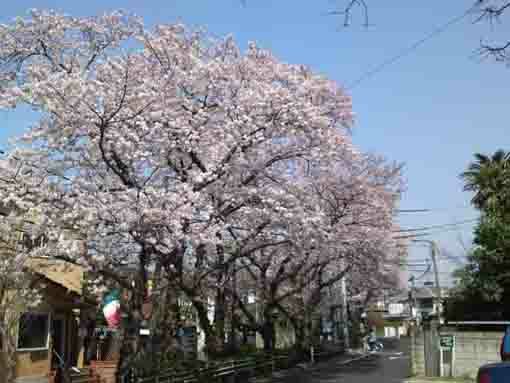 A row of cherry trees lining Cherry Blossoms Causeway Park is extending to north, then to west along Mamagawa River. The west end of the cherry trees, there is a small shrine worshipped as a god of arts called 'Ukishima Benzaiten (Benzaiten on a floating island)' under cherry trees. According to 'Ichikawa no Bungaku (Literature at Ichikawa city)' published by Ichikawa City Board of Education in March 1982, there are over 120 writers and poets in connection with Ichikawa city listed on. In the field of modern literature, it describes about 90 of them such as Sachio Ito, Soseki Natsume and so on and a part of their works. 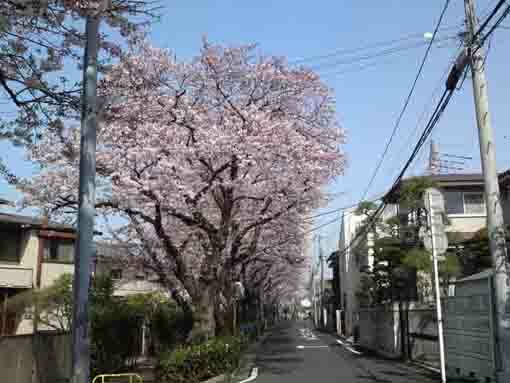 The city selected 3 writers having the deepest connections with the city, Hakushu Kitahara, Rohan Koda and Kafu Nagai and fixed a road following their footprints. 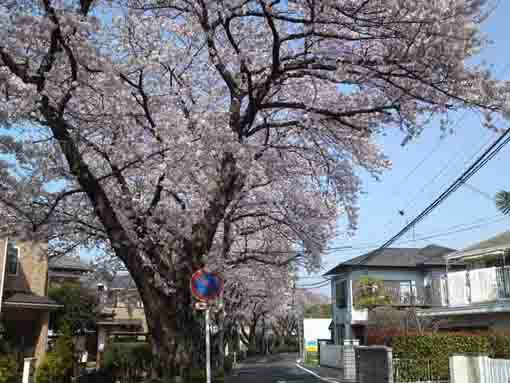 The road starts from Keisei Yawata Staion, then Shirahata Tenjin Shrine, Cherry Blossoms Causeway Park, Tekonabashi Bridge, Kameiin Temple, Tekonareishindo Shrine, Mamasan Guhoji Temple, the end of the course, it goes to Shiensoja in Satomi Park. Out of the board, Shiki Masaoka, Kyoshi Takahama, Ryokuu Saito, Shotaro Yasuoka, Miyuki Miyabe, Haruki Murakami, Shizuko Natsuki, Yasuo Uchida and other many writers and poets wrote some site in or people from Ichikawa city in their works. Moreover Sanetomo Minamoto of the third Shogun of Kamakura Bakufu, Nichiren of the founder of Nichiren Sect and Chomei Kamo an essayist in Heian Period wrote poems describing 'Mama no Tsugihashi'. 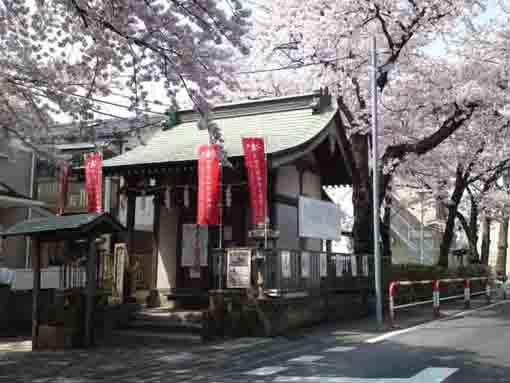 The west end of Sakura Dote (Cherry Blossoms Causeway), there is a small shrine called Ukishima Benzaiten. According to the Folk of Ichikawa, the Benzaiten was discovered in early Meiji era. Ukishima Benzaite is popularly worshipped by many people as the god of arts. The history of Ukishima Benzaiten is very long, according to existing records of construction, there remains the date of Febraury 1841 in it, so it is supposed to be founded older than that on the records. According to Konkomyosaishookyo (the Mahayana Sutras), Benzaiten is always decorated to eight hands and her figure looks decent like the moon, so Ukishima Benzaiten is also elegant and her head wound around by the White Dragon King sits on gracefully. The venerable Kenkoin Nisshin, the 74th abbot of Ikegami Honmonji Temple and the 70th of Mamasan Guhoji Temple, inserted the eyes into a Buddhist image. The shrine was on the small island (called Benten no Mori (the woods of Benten), now it is a pumping plant) extending to Mamagawa Rive the right-handed on the Mama Elementary school, so people had to cross the bridge from both side. Moreover it was said that there was a large Japanese zelkova tree behind the shrine and a white snake had lived in a hallowed in the base of the tree. Traditionally, it was said that many people could achieved their wishes having prayed to Ukishima Benzaiten, those who wish their glory and wealth would succeed in life and build fortunes; those who wish to be pure in heart and pray for the prosperity of their posterities could be given good fortune and wisdom, and those who wish to improve their academic works and professional skills could master the essence of the works and skills, so many people from not only its neighborhood but also distant places have visited right up to this very day. The snake day of the twelve symbols of the Chinese zodiac comes once in twelve days. The snake day is a lucky day over money and wealth since it is said that one's wish would be delivered to Benzaiten if the one prays to the white snake of her messenge in the snake day. Sakura Dote Park (Cherry Blossoms Causeway Park) as the Path of Literature has great accessibilities from both Narita and Haneda International Airport. 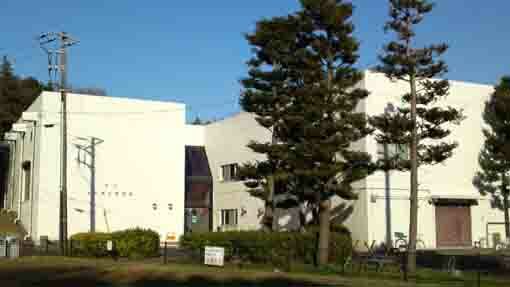 Take 10 minute walk from Ichikawamama Sta. Ukishima Benzaiten has great accessibilities from both Narita and Haneda International Airport.